Is This The Most Compelling Reason For Men To Do Housework? 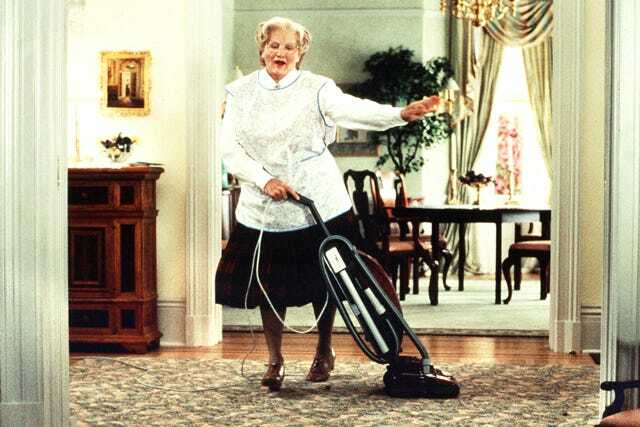 In the film Mrs. Doubtfire, Robin Williams dresses up as a woman and does housework just so he can spend time with his children after his divorce. While Williams is undoubtedly a great comedic actor, I'd argue that one of the reasons the movie was (and remains) such a big part of our cultural consciousness was the sheer novelty of a guy putting aside societal expectations of what a man should be and taking on a more active role in his children's lives. While times have definitely changed since the early 1990s, I don't think it's a stretch to say we haven't come as far as we'd have liked concerning gender roles in the (heterosexual) home. But, it seems there's another concrete case to be made for men doing housework (besides, you know, gender equality). A new study, set to be published in the next issue of Psychological Science, found that a more equitable division of labor between Mom and Dad can play a big role in the career aspirations of children — particularly girls. Researchers at the University of British Columbia recruited 326 kids between the ages of 7 and 13, along with one or both of their parents. All of the subjects were asked to complete a survey on the division of chores in their household and how gender roles were constructed in their family. Then, the researchers assessed the kids' ambitions as well as whether they thought these should be focused more on family or on work. The results showed that the way gender roles were defined by children's parents — both implicitly and in the division of labor — had a major impact on how both boys and girls viewed their place in the world. Perhaps unsurprisingly, the authors note, "The more mothers enacted and identified with traditional roles at home, the more their children (especially daughters) envisioned themselves fulfilling gender-stereotypical roles in the future." However, the most influential factor upon the girls' aspirations was their father's role in the home. Dads who shared housework more equally with their partner were more likely to have daughters who had professional ambitions outside of the house. Of course, it's almost a no-brainer that growing up in a household where gender roles are defined in a "nontraditional" way would give children a less rigid idea of what their own future might look like. But, this report is the first to identify what study author Alyssa Croft calls "a unique gatekeeper role" that fathers play in the home. Obviously, there's absolutely nothing wrong with men or women making the decision to take the lead on the housework front. But, a little bit of dad laundry duty, it seems, could go quite a long way toward making sure that all kids realize the full spectrum of what their future could hold.